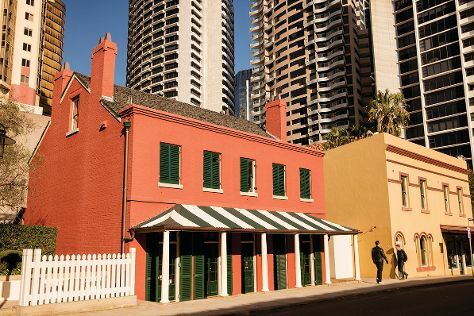 Deepen your sense of the past at sights like The Rocks and Museum of Sydney. Let the collections at Australian National Maritime Museum and Hyde Park Barracks Museum capture your imagination. Step out of Sydney with an excursion to Norman Lindsay Gallery & Museum in Faulconbridge--about 1h 20 min away. There's much more to do: see a show at Sydney Opera House, admire the masterpieces at Australian Centre for Photography, take a stroll through Darling Harbour, and enjoy the sand and surf at Bondi Beach. To find traveler tips, photos, ratings, and more tourist information, use the Sydney planner . San Francisco, USA to Sydney is an approximately 17-hour flight. You can also do a combination of train and flight; or do a combination of bus, shuttle, and flight. The time zone difference moving from Pacific Standard Time to Australian Eastern Standard Time (New South Wales) is 18 hours. Traveling from San Francisco in April, expect Sydney to be somewhat warmer, temps between 73°F and 59°F. Wrap up your sightseeing on the 1st (Wed) to allow time to travel to Melbourne. 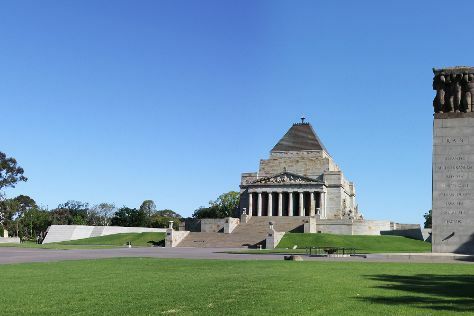 Start off your visit on the 2nd (Thu): examine the collection at Melbourne Museum, get engrossed in the history at Royal Historical Society of Victoria, take an in-depth tour of Immigration Museum, then learn about all things military at Shrine of Remembrance, and finally explore the world behind art at Craft Victoria. On the 3rd (Fri), you'll have a packed day of sightseeing: examine the collection at The Ian Potter Centre: NGV Australia, then admire the masterpieces at National Gallery of Victoria, and then browse the exhibits of The Johnston Collection. For traveler tips, other places to visit, maps, and more tourist information, read Melbourne travel route planning website . Traveling by flight from Sydney to Melbourne takes 3.5 hours. Alternatively, you can do a combination of flight and shuttle; or drive. In May, Melbourne is a bit cooler than Sydney - with highs of 63°F and lows of 46°F. Wrap up your sightseeing on the 3rd (Fri) to allow time to travel to Uluru-Kata Tjuta National Park. Do some cultural sightseeing at Uluru-Kata Tjuta Cultural Centre and Walkatjara Art. Visiting Uluru and Kuniya Walk will get you outdoors. There's much more to do: take in the dramatic natural features at Kata Tjuta, stroll through Uluru Hiking Path, take in the pleasant sights at Field of Light, and contemplate the waterfront views at Mutitjulu Waterhole. For photos, where to stay, more things to do, and tourist information, use the Uluru-Kata Tjuta National Park visit planner . Getting from Melbourne to Uluru-Kata Tjuta National Park by flight takes about 5 hours. Other options: drive. When traveling from Melbourne in May, plan for somewhat warmer days in Uluru-Kata Tjuta National Park, with highs around 76°F, while nights are about the same with lows around 51°F. Wrap up your sightseeing on the 6th (Mon) early enough to travel to Cairns. Start off your visit on the 7th (Tue): see some colorful creatures with a scuba or snorkeling tour. Get ready for a full day of sightseeing on the 8th (Wed): take in the exciting artwork at Bones and Jones, then take in the exciting artwork at Village Gallery, and then look for all kinds of wild species at Hartley's Crocodile Adventures. For where to stay, more things to do, other places to visit, and more tourist information, you can read our Cairns online route planner . You can fly from Uluru-Kata Tjuta National Park to Cairns in 5 hours. Another option is to drive. 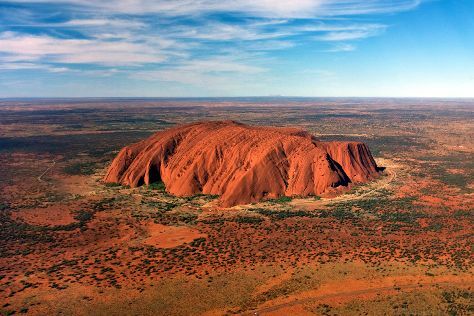 In May, Cairns is a bit warmer than Uluru-Kata Tjuta National Park - with highs of 82°F and lows of 69°F. Wrap up your sightseeing on the 8th (Wed) to allow time to travel back home.